Published on August 9, 2017. Last month the National Trust made a submission to the West Gate Tunnel Project Environmental Effects Statement (EES) released by the Western Distributor Authority, following a 6 week exhibition process from 29 May to 10 July 2017. The National Trust’s primary concern regarding this project is the impact to natural heritage due to widespread losses of healthy mature trees, long term impacts on native vegetation, particularly within the waterways and environs of Moonee Ponds Creek and Stony Creek and the visual impact on heritage places. Substantial green infrastructure is proposed to be removed across entire footprint of the project with an estimated 3,347 trees degraded or removed, including 2,954 medium to long term viability trees. Read our full submission here. 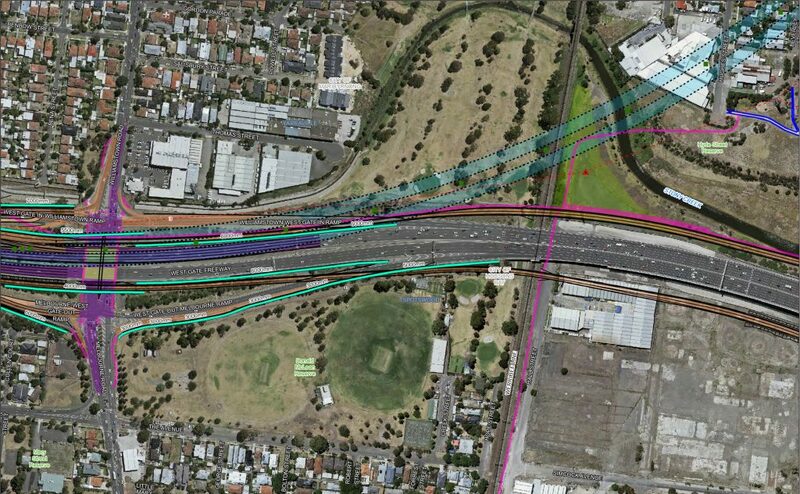 The environmental values of the Stony Creek and the Hyde Street reserve will be impacted by the off-ramp connecting the West Gate Freeway to Hyde Street proposed by the WGTP, pictured below. The construction of the off-ramp and its associated piers are considered to impact the flow and hydrology of Stony Creek and its associated vegetation. The EES documentation contained alternatives for the Hyde Street ramp across Stony Creek and we advocated for these options to be pursued. Blue lines in this map indicate the proposed off ramps crossing the Stony Creek reserve area. Community connection to the Stony Creek and Hyde Street reserve should be taken into account, including work by the Friends of Stony Creek to rehabilitate native vegetation since the construction of the West Gate Freeway. We have suggested that further consideration should be given to the alternatives documented in the EES. 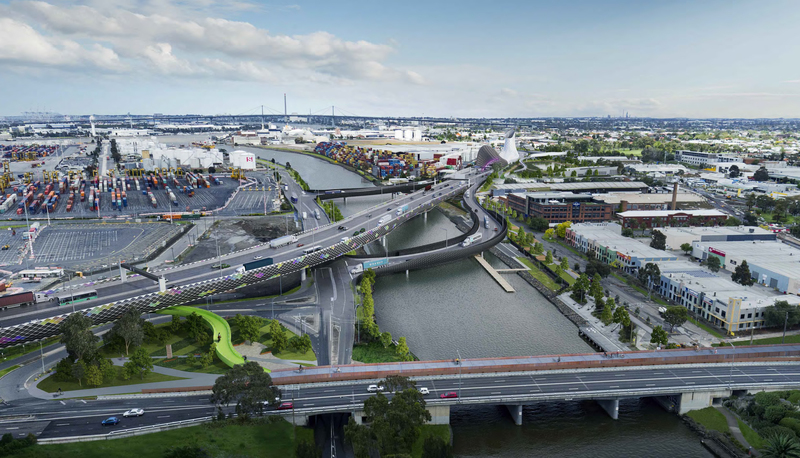 The WGTP proposes to widen the CityLink crossing of Moonee Ponds Creek, with the addition of new on and off ramps. The ecological value of the Moonee Ponds Creek corridor will be compromised by this extended structure which will see more of this section of the creek under permanent shade, impacting on the natural heritage values of the site. While recognising that existing infrastructure already exists across the Moonee Ponds Creek, NTAV has concerns regarding this additional infrastructure which will impact on the City of Melbourne’s intentions to rejuvenate its ecological values in the future. Portal and ventilation structures are proposed at each end of the tunnel component of the project. These are substantial built structures, with a height in excess of 50m and length of 200m. The scale and height of these portals will form a significant landmark dominating the surrounding landscapes of the Bradmill industrial site and the Yarraville Gardens. We submitted that the size and scale of the portal structures be reconsidered to account for the heritage values of the surrounding landscape and its residential setting. Westbound southern portal and ventilation structure, with the Bradmill industrial site in the background. The context of the Bradmill industrial site will be impacted with the portal structure dominating the boiler house building in height and scale, as pictured here. Northern portal and ventilation structure, looking east toward the city. 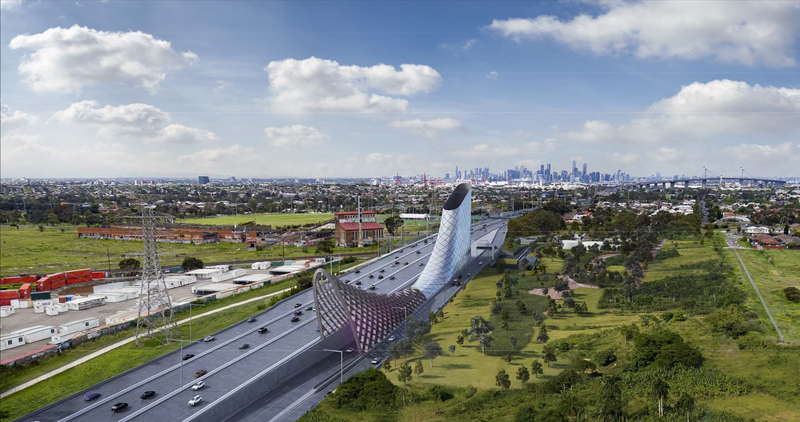 Our submission highlighted the combined visual impact of the portal, raised shared path (pictured in the lower middle) and associated freeway infrastructure (bottom right) on the Yarraville Gardens which are located immediately opposite this structure. This design will have a significant impact on the heritage values of the gardens. We maintain concerns regarding impacts on the Yarraville Gardens (HO138, City of Maribyrnong) including tree removal, groundwater drawdown and extent of nearby built infrastructure associated with the WGTP. The Yarraville Gardens are locally significant as the earliest surviving public garden in the municipality and contain a significant collection of mature trees. The combined visual impact of the portal, raised shared path and associated freeway infrastructure on the Yarraville Gardens will have a significant impact on the heritage values of the gardens. This impact is made more problematic given the scarcity of such values elsewhere in the municipality. 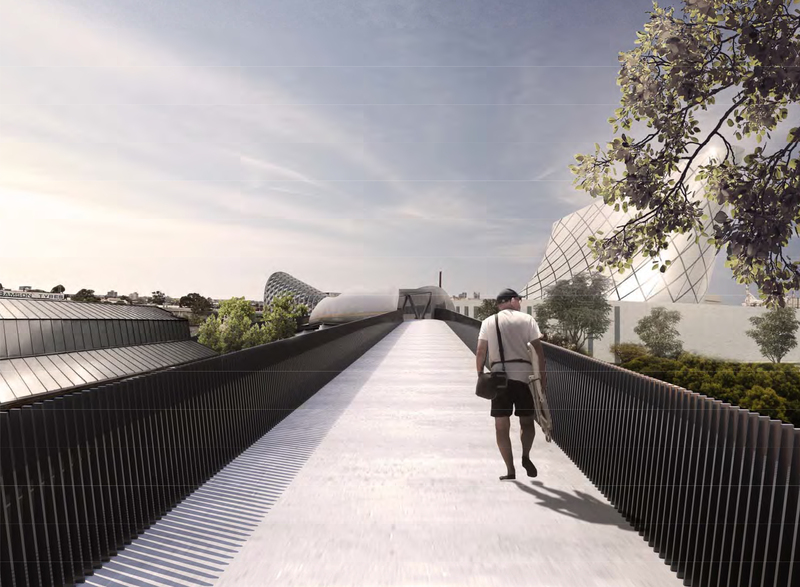 The artist impression of the shared pedestrian and bicycle bridge along Harris Street presents the large extent of built infrastructure in close proximity to the Yarraville Gardens northern boundary and is considered to be a visual intrusion into the gardens, particularly views toward the north-east. The construction of this path would require the removal a series of mature trees on the Harris St side that contribute to the character of the garden as a whole. 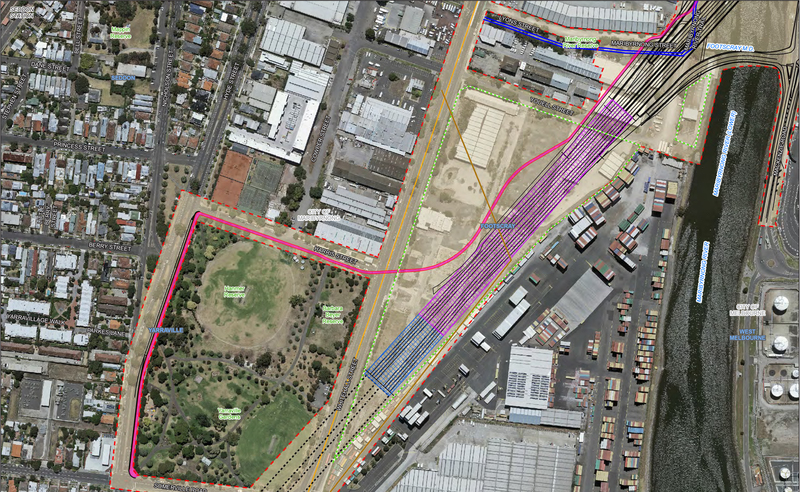 This map shows the proximity of built infrastructure to the Yarraville Gardens where the tunnel is proposed to reach ground level to the east. The blue and purple shading indicates the location and size of the Northern portal and ventilation structure. We have serious concerns that the WGTP proposed Maribyrnong River crossing adversely impacts upon the heritage significance and context of the Maribyrnong River, including view-lines and the associations of built heritage with the river environment. The height and scale of these bridges has an impact the river association and built context of several heritage buildings on the west side of the river. These buildings include the Barnett Glass Rubber factory (HO78, Maribyrnong City Council) and the Mowling’s Soap & Candle works (HO178, Maribyrnong City Council). The context of these buildings in relation to the Maribyrnong River and the surrounding urban environment will be permanently disrupted by the proposed bridges which overshadow the scale of these buildings. This would have an unreasonable impact on the Maribyrnong River context, view-lines and historical connections to the development of the city, and we submitted that detailed design and siting for these bridges should be reconsidered to mitigate these concerns, and in so doing be more responsive to the significance of the river environment. The architecture of the three bridges proposed to cross the river is substantial, dominating the urban environment. The height of the bridges ranges from 7-11m, which forms an imposing built structure, particularly when viewed from ground level. Associations of the urban environment with the river as an important landscape feature and view lines across and along the river will be compromised as a result. An independent Inquiry and Advisory Committee (IAC) has been appointed to consider the EES and public submissions. The IAC will conduct public hearings that are scheduled to begin on 14 August 2017.